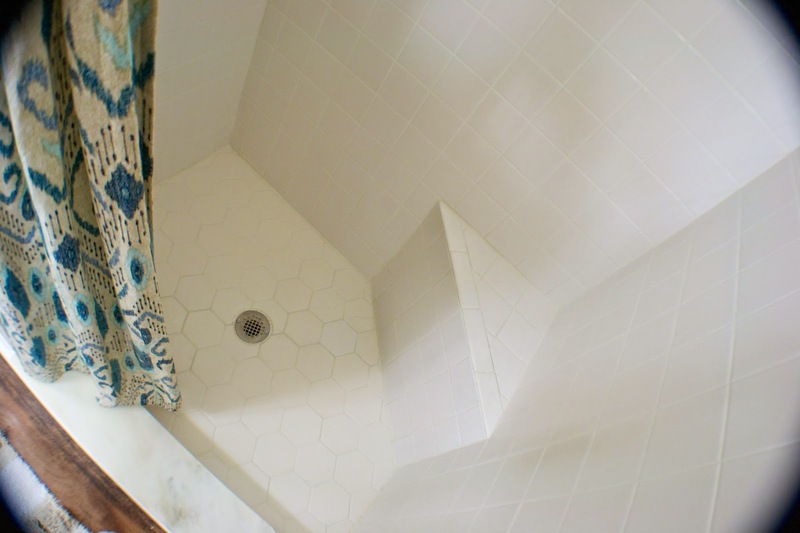 Less than a year ago, we thought we had finally conquered the grout issue in our master shower. Well, less than 6 months later, things were back to a pretty gross state. Really the grout itself wasn't in very bad shape but the new caulk was looking moldy. 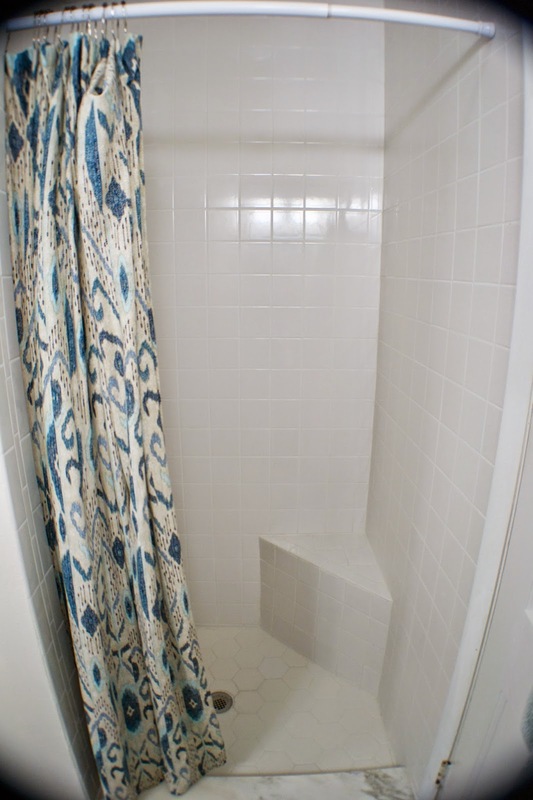 Since things were looking less than stellar and all of other fixes weren't working, we decided to have the whole shower re-grouted a sprayed before we listed the house. 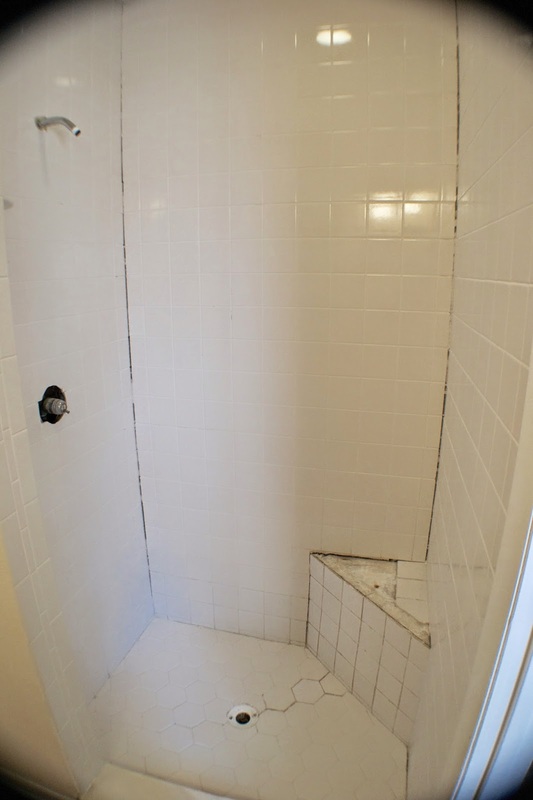 We found someone local that would do the shower for $550 which I initially thought was a bit steep but then I thought it was a steal when one guy ended up spending 11+ hours in one day completely overhauling the grout situation. Since it's a pretty small bathroom and I didn't want to get in the way, I only got these couple of shots when he took a break. This is 3 or 4 hours in and he had just gotten all the caulk removed. Apparently, this was the biggest issue. There was so many layers of caulk that it was easy for bacteria and gross stuff to get trapped. The second issue was the cracks in the grout in the bench and floor. 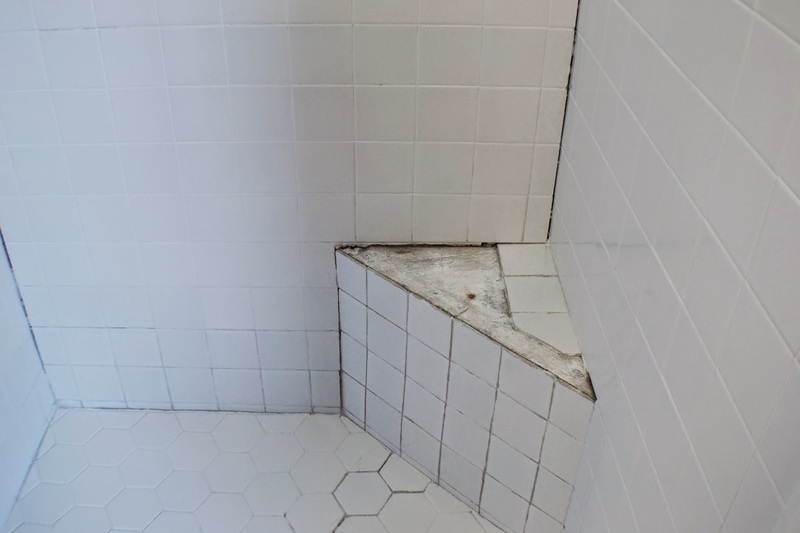 The tiles on the bench popped off so he had to reattach them and surprisingly, while there was some extra moisture under the tiles, everything looked in really good shape (we were fully expecting mold/structural issues). Over the rest of the day, he removed all of the grout, cleaned everything up and re-grouted the stall. He grouted all the corners so there would be no caulk in this shower to mold up and cause issues. Everything looked so good after he finished grouting the we nixed the idea of spraying the shower. The majority of the grout dried in a day or so but due to the extra moisture behind the tiles, some grout lines were being really stubborn about drying. We ended up running a dehumidifier in the shower for about a week at which point things were looking pretty awesome. The last thing I did was I went over every seam with grout sealer. This should help protect the shower from water going through the grout lines and keep things looking this good for much longer! So that finishes up the overhaul on this bathroom. We are in this state where it's much more pleasant to use this room but we kinda don't want to use it and mess it up. If you want to see everything else we did in this room, follow the links below!